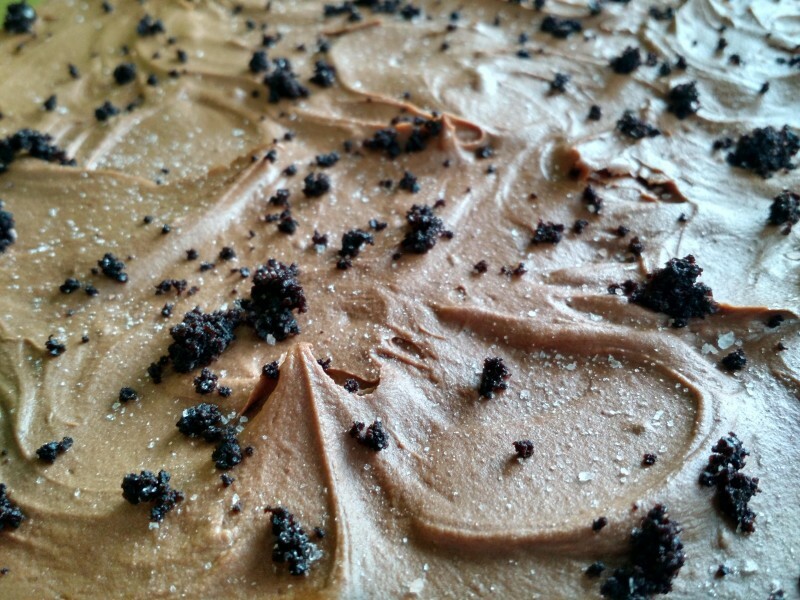 Dark, dark chocolate from the cake to the pudding filling to the fudgy frosting earn this cake its name: Blackout cake! When I was a kid growing up in a leafy suburb East of LA, Joe Torcaso and his family lived up the street from us. His whole family was always wonderful to our family and my Dad always had a special fondness and appreciation for Joe. One typically warm summer evening we were coming back into LA on the part of the 5 that bridges the San Joaquin Valley and the LA basin. This is a stretch that I’m sure all Californians know as “The Grapevine” because of its winding nature. I’m sure I was not the only one to stare through the car windows at those approaching hills with dread–the relentless grade through probably the second hottest part of California made victim of many a tired engine and seeing cars pulled to the shoulder was a consistent reality. On multiple occasions, our tired station wagon was among them. But on this summer evening, it was a different problem in a different car that pulled us off the freeway–a tire blew out. I was too young to understand all the circumstances, but we needed a ride to get a new tire and my Dad called for help. Out of all the people he could have called, he called Joe Torcaso. Now, maybe you’ve heard of the LA basin? It’s big. And we were stuck on the far Northwest corner of LA county while home (and Joe) was on the far Northeastern corner. Joe had about an hour’s drive ahead of him and that again to get home, but still, he came and took my Dad to the tire store so we could get a tire and get home. I remember my Dad saying then and I definitely understand now that the people who would do that kind of thing for you are on a very short list. Fast forward some mumble-mumble years and I live a thousand miles away from that leafy suburb in an entirely different leafy suburb of an entirely different major city, but still, we live just a few homes away from someone on a similarly short list of people who measure up on what has become a friendship metric for me: would you drive an hour to help that person? Would they drive it for you? And if you have the good fortune of being friends with Scott, you know this is absolutely true–he belongs on that list. Scott is the kind of person who would drive an hour to you and an hour home on a nasty stretch of road (I can only compare it maybe to being stuck at Timberline or Trillium Lake) just to bring you a tire. There are a lot of motivations behind why people do what they do, but Scott is one who does things for the right reasons. He hates getting attention for the good things that he does because he would be the first to correct you–it’s not about him–it’s about the kids he coaches in Soccer. Or it’s about stepping up to do something because you should take action, not just complain. Or it’s about the elderly neighbors needing help with Neighbors Helping Neighbors. Or it’s about preserving the community pool so that future generations of kids in this leafy suburb will have the same treasured memories that this neighborhood’s kids have had since the late 70’s. It’s not about him, it’s about them. So his reasons for not wanting to bring the attention back on himself are pretty not-crazy, but still, every once in a while, it’s important to pay respect and notice the things people do when we’re not looking at them. What’s funny is that if you let yourself be fooled, you may think him cranky or opinionated or rough edged. And while there’s some truth to that–he’d more readily admit to these traits than any others I’m sure–if you stopped there, you’d walk away with an incorrect understanding of someone who, shhhh, is in many ways a total softie with a powerful devotion to his strong daughters and sweet wife; and with a huge heart for his community and the people who live there; and a respect for everyone, even people with whom he disagrees. Fudgy bittersweet chocolate frosting, chocolate cake crumbs, and finely ground Himalayan pink salt = chocolatey perfection. Which makes it completely unsurprising that his wife would request a densely chocolatey chocolate cake for a “big birthday”. There’s something about chocolate plus chocolate plus chocolate that makes it a direct hit to the heart. 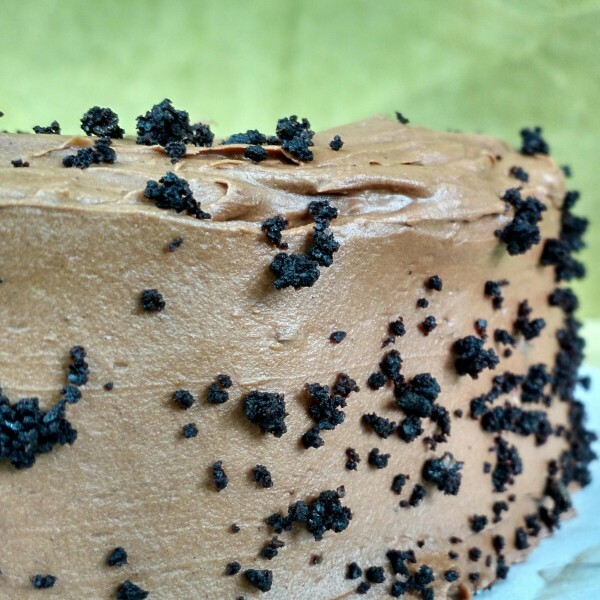 Accordingly, I chose a Blackout cake for Scott–a tender, moist, densely chocolate cake with a rich chocolate pudding filling that combines the sweetness and slightest bitterness of dark chocolate for complexity. A fudgy bittersweet chocolate frosting coated it all and was then dusted with chocolate cake crumbs and the finest sprinkles of Himalayan pink salt to ground and give depth to all that sweetness and richness. He is indeed–we were fortunate to have been neighbors! I noticed your email address–how are you connected with the family? The Dahlgren family sends our best wishes to the Torcaso family!